Well I have been writing this blog for a few months now and it occurred to me that I really haven't told you much about me. I wrote about D and Simon (Daddy) quite regularly but I tend to forget to write about me. 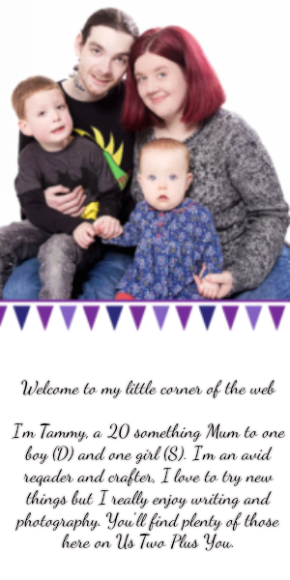 So I have decided to do a getting to know me type post as our about us page is about all of us as a family. I am Tammy, I am mum to one (sometimes two!) and I am the oldest of my 12 siblings (yes really, there's 12 of us!). I however was always the 'weird' sister. My dad has a Christmas tree angel the is unconventional (Gothic) and I still remember the day it first came out of it's box, from that moment on the angel is simply known to my sister as Tammy (even now years later! ). I love to be creative, I could spend hours drawing, painting, sewing, crafting or writing if you let me. There's just something appealing in making things with my own two hands or changing something practical into something beautiful (in my own eyes anyway.) I also love to read. Before D came I spent hours and sometimes days just reading. it takes me around 13 hours to read a 800 page book. I can forget to sleep if I get sucked into a really great book. Reading a book for me is like travelling into a different world, a world that author has created in their own wonderful mind (that never ceases to amaze me!). I particularly love books that come in a series and have a 'supernatural' vibe to them. I sometimes find myself invested in a series of books and am rather sad when they end. 8. I have a birth mark that covers 90% of my hand. 10. my favourite body part is my eyes. They change colour (really) depending on my mood and my thoughts. I am being serious.